From electron microscopes to earth-orbiting observatories, scientists use a variety of instruments to study nature by measuring, observing and yes, rendering. Measurements are graphed and fitted with mathematical models. Renderings, on the other hand, are not so easily quantified. This can make them less useful for the business of building quantitative models and making predictions. But renderings can, in an instant, convey a powerful message. A picture, as they say, is worth a thousand words. Suddenly a coherent structure is apparent. Such renderings provide an immediate peek at the phenomena at work. They provide higher level information than do mere measurements. 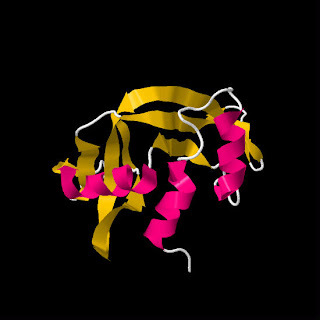 And it is interesting that these renderings were made with graphing tools that know nothing of ribonuclease A or ribonuclease inhibitors, in particular. 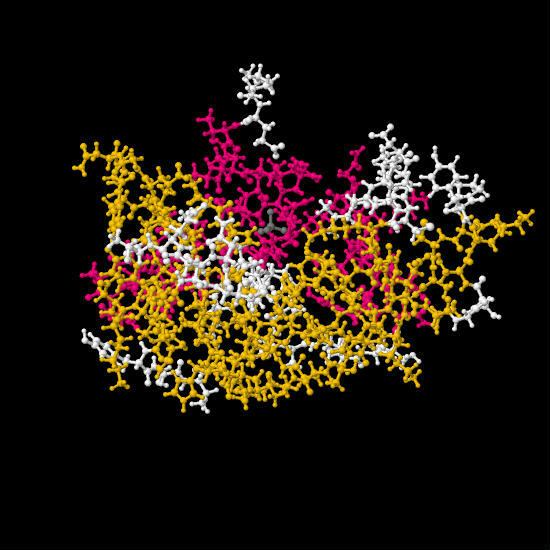 Computer scientists have developed these powerful rendering tools based on general principles of protein structure. But these tools do nothing without the structural data provided by measurement techniques, such as X-ray diffraction. So as with electron microscopes and astronomical observatories, these molecular tools create impressive, beautiful and meaningful renderings that are completely dependent on the measurements. The computer scientist creates the tool, but has no idea what rendering might emerge after the raw data are input. A recent example of the power of rendering, and the importance of stepping back and choosing the right perspective, is the frog embryo’s electric face. If that sounds strange read on, for as one researcher said, “electric face” is the perfect description. Electricity is not just for engineers, it is crucial in biology as well. For instance, a cell contains various ionic compounds which give the cell interior a net charge. And the difference between the intracellular charge and that of the the external environment causes a voltage across the cell membrane. This membrane voltage is crucial in cellular biology. For instance, a wide variety of membrane proteins, such as channels that allow chemical in and out of the cell, are controlled by the membrane voltage. Change the voltage and you suddenly change the state of those proteins and their various actions. The frog’s electric face is one of those renderings worth a thousand words. We could make detailed protein measurements showing that evolution cannot even explain how a single protein could have arisen. In fact there are 27 orders of magnitude between evolution’s expectations and reality. And that is going by the evolutionist’s own reckoning (in reality it is 100+ orders of magnitude). Or we could make detailed measurements of mutations and show that unicellular organisms are not likely to evolve spontaneously into elephants. But the frog’s electric face, in an instant, reminds one of the utter absurdity of evolution. Religion drives science, and it matters. bornagain77?? Oh, no... Leave all sanity behind, ye who enter. Unicellular organisms transform into elephants everyday. And Birds, and cats, and every sort of animal, including humans. You did it yourself in nine month in your mother's womb. Ritchie said, "Unicellular organisms transform into elephants everyday"
And what the unicellular organisms transform into is precisely defined from the start by multiple levels of cellular systems processing and controls. Such precision contradicts goo to you evolution. Why does it contradict evolution Tedford? You keep making the same blustering claim based on your ignorance and personal incredulity day in and day out, but you can never provide evidence for why. It doesn't necessarily contradict the goo-to-you sequence. It does, however, contradict neo-Darwinism - that this happens from random mutation and natural selection. It also destroys many other parts of evolution, such as morphology-based phylogeny. If the development is guided by information instead of happenstance, then there is no reason to presume that, for instance, the principle of parsimony should apply.